Performer Ankur Bahl jumps rope while describing a homophobic attack. Lloyd Newson, artistic director of DV8, a cutting-edge physical theater company based in London, was listening closely. Newson had a particular reason to be interested in Robinson’s comments, and in the fallout from them: For more than a year, he’d been collecting interviews and statements from gay Londoners of all ages, ethnicities, and religious backgrounds, as well as comments from those who condemned their sexual orientation and practices. The results of those interviews formed the basis of DV8’s latest stage production, To Be Straight With You, a hard-hitting, controversial look at the intersection of homophobia and religion in Britain today. Robinson’s comments hit the news when the company was on a summer break, and Newson decided the story should be integrated into the show. And so, that summer, he flew to Northern Ireland to interview Stephen Scott, the 27-year-old who had been beaten. Scott told Newson that following the attacks and the resultant media attention, he had received so much verbal abuse when in public that he had been forced to remove his arm cast and dye his hair to avoid being recognized. DV8 Physical Theatre's <em>To Be Straight With You</em> examines issues of tolerance and intolerance. What he saw, when he looked around, was intolerance in many forms. He saw racism and religious persecution, but he also saw that the very same groups who suffered from these types of discrimination were the least tolerant of homosexuality. In order to address the issue of homophobia in British culture, Newson and his research team began by conducting 85 interviews, a few with targeted subjects, and many with people they found on the streets, outside churches, or in nightclubs. Some were reticent to speak at all, and many declined to have their names or their specific circumstances included in the show. Out of those 85 interviews, Newson whittled it down to 25 he felt encompassed larger themes. Every word spoken in To Be Straight With You comes directly from these interviews. Once they had their text, the complicated process of setting movement began. “Most dancers are trained to re-create pretty, nice movement,” Newson explained. “But if we were doing pointed feet and high legs while the story was about something very harrowing or disturbing, it would be insulting to the interviewee, and it would completely counter what we were saying.” Instead, Newson and his cast experimented with ordinary gestures and actions. In one case, they were working on an interview with a gay Muslim man who was 15 years old when he came out to his family. In the interview, the subject explained that his father and brother found the news so unacceptable that they stabbed him. After rejecting a number of different ideas about how to stage this story, Newson discovered that the performer he was working with had once been a champion at the jump rope. They had found their answer. 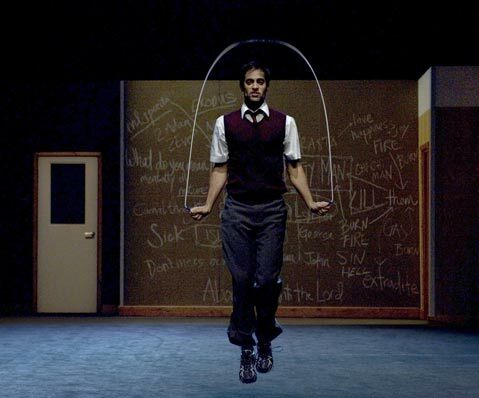 The action of skipping rope captured the speaker’s youthful exuberance, but also functioned as a kind of heartbeat, speeding when the speaker recalled distressing scenes, and slowing when he was at ease. “The struggle to try and find an element of honesty in the work dominates everything we do,” Newson explained. Arts & Lectures brings DV8 to the Lobero Theatre (33 E. Canon Perdido St.) for three performances of To Be Straight With You on November 18-20 at 8 p.m. There is no late seating for this event. For tickets or information, call 893-3535 or visit artsandlectures.ucsb.edu.